Currently WinTAX4 is undoubtedly in the top ranking of PC applications for data acquisition and analysis in Motorsport competitions. This is the result of more than 20 years of continuous evolution and close partnership with the top teams in F1, DTM, WRC, Le Mans Series, GT, MotoGP and SuperBike. When combined with Magneti Marelli’s ground-breaking Telemetry System, WinTAX4 provides highly advanced real time analysis functions as well a standard interface to team’s proprietary software applications. With a radio link the race vehicles can even be monitored from remote base stations. With an Ethernet cable link, the telemetry can be exploited in the laboratory or at the dyno. 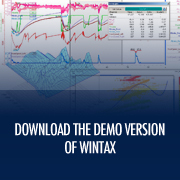 WinTAX4 is equally suitable as data analysis tool for third party telemetry systems. Its extra modules allow you to decode uploaded data or live telemetry from any external Datalogger. The integrate CAN lines analyser with support of DBC files is the perfect integrated instrument for monitoring, live, either electronic devices or full car diagnostics from the OBD plug. Offering data protection, add-on modules and dedicated support to develop innovative and integrated solutions, WinTAX4, Magneti Marelli’s flagship data management tool, is the perfect solution for the most ambitious development programmes. WinTAX4 is your essential tool for the race track and the dyno: its graphics capabilities, mathematics processing and configurability make it the crucial instrument for diagnostics and development of the vehicle. WinTAX4 is also optionally provided by different modules which increase its openness and capability. By external applications, just for example Excel®, Matlab® or Simulink®, you can access telemetry data and all WinTAX4 configurations both in reading and writing mode. This allows to use WinTAX4 as analysis tool even thought the Datalogger is not provided by Magneti Marelli or convert external database formats. 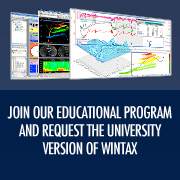 Many analysis and reporting windows: time/distance line, 2d Scatter, 3d Scatter, Bargraph, Frequency, Histogram, Trend, lap by lap Report, Events, Diagnostics, Numeric, Alarms, Pop-up, Gauges..
WinTAX4 is licensed with four different levels each characterised by different functions. Starting from JUNIOR level up to the TEAM and PRO formula used by professional data analyst working in Motorsport.